Dubai, March 02, 2019 – Gulf Craft, the Emirates pioneer builder of luxury yachts and leisure boats arrives at the 27th edition of the Dubai International Boat Show with a fleet of 12 vessels. The triple-deck Majesty 140, the biggest superyacht in Gulf Craft's collection for this year's show is a masterpiece that will capture all the attention. The award-winning Majesty 100, famed for her sky-lounge deck, will also be on display along with the owner-managed Majesty 62. Riding the waves of success, Gulf Craft introduces an all-new range of innovative solar-powered Nomad Yachts, the next generation of Oryx Sport Cruiser and a new breed under the Silvercraft fishing boats. 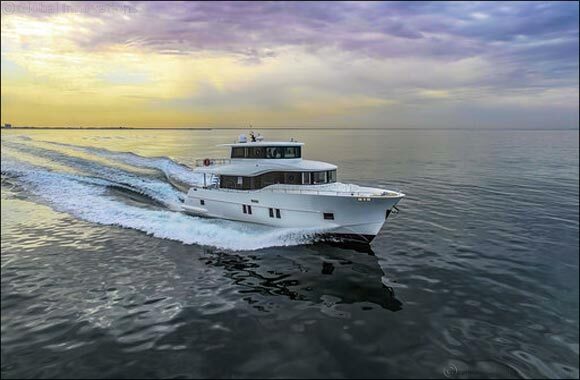 The company hails the year 2019 as 'The Year of Nomad Yachts' as it harnesses a smart approach to family yachting with its range of environment-friendly yachts. In line with its serious steps to reduce its carbon footprint, Gulf Craft will be offering customers the solar-power option for all its yachts in the future. Foreseeing a great market potential for practical, long-range luxury yachts, Gulf Craft launches three brand new Nomad Yachts called the SUV (Sports Utility Vessel) Collection. The Nomad 95 SUV, Nomad 75 SUV and Nomad 65 SUV all feature semi-displacement hybrid hulls designed to withstand any sea condition and are able to travel long distances. British Naval Architect Andrew Wolstenholme is responsible for the design of the hulls of the new Nomad Yachts, while the exterior styling and interior design of the vessels have been the work of Gulf Craft's own in-house design team. The new yachts have been built using lighter, stronger and rigid advanced composites like Kevlar and carbon fibre to increase stability and fuel-efficiency. The new Nomad Yachts will cater to those adventurous seafarers with a desire to explore new cruising grounds. The yachts are engineered to offer premium comfort, safety, and oceangoing capability. All the vessels under the Nomad Yachts brand feature a functional design that meets 'CAT A' specifications and the brand's flagship Nomad 95 is built to Bureau Varitas Commercial Charter. The next biggest surprise at this year's Dubai International Boat Show is the world premiere of the much-anticipated Oryx 379 sport cruiser. A step forward with a new brand DNA, the new 379 has been designed by the upcoming Emirati designer, Hussein M. AlShaali. The completely restyled chic 37-foot sport cruiser boasts an impressive use of space. It can sleep 4 guests in absolute comfort. Gulf Craft started off successfully building catamarans for its power boat racing teams during its early years but has not continued in this market for leisure. This year, the company returns to its roots with the launch of two new versions of the SilverCat 34 catamarans - a center console fishing boat and a hard top version. Both are efficiently powered by 2 engines instead of the regular 4 engines in a boat of a similar size. Every year, Gulf Craft fascinates the world with its innovative range. This year, it continues its voyage, investing its successful track record to shape a whole new collection of yachts and boats. One of the most prestigious marine events in MENA, the Dubai International Boat Show will be held from 26th February to 2nd March. For the second year in a row, the show is being held at its venue on Dubai Canal. Gulf Craft will be welcoming guests at stands MD 10.